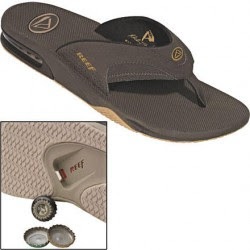 Sandals with bottle openers. I love this innovation. I suspect that Reef really understand their customers - and have found that lots of them are young men and women with a fondness for beer. I remember when these first launched in Oz a few years back. Apparently, the idea came from Mick Fanning, a pro surfer who's also known to enjoy a beer or two. So in this case Reef's just listened to what the people want and played the role of facilitator. This kind of thing should happen more often.